A place so beautiful words cannot describe it. If you are looking for a romantic getaway then look no further. Gangga Island is a small island with a coral sand beach with some amazing diving within minutes of the resort. Gangga Island is home to world class diving coupled with blue skies, amazing food, happy people and smiles all round! Located at the amalgamation of the Indian and Pacific Oceans, with more than 30 world class dive sites, the island offers a wonderful variety of marine life including fringing reef slopes and pinnacles carpeted in soft corals. Gangga is the ideal starting point for diving the Bangka Archipelago, Bunaken National Marine Park and also Lembeh Strait as diving trips are organised on a regular basis to these magnificent spots. Gangga Island is a romantic, intimate and majestic resort offering spectacular diving opportunities allowing you to experience diverse marine life from both the Indian and Pacific Ocean. Romantic diving at its best! Pasang Spa is the ideal place to relax and unwind tired muscles after diving, trekking or exploring Gangga Island. Gangga Island may be an incredible diving destination, but there are also fantastic places to explore above the water as well. Just a short boat ride takes you to back to mainland Sulawesi where there are gorgeous highlands and incredible cultural sights to be found. Gangga Island is small island offering a unique opportunity to dive some of the finest Indo-Pacific dive sites. It is perfectly situated to access both the North Sulawesi coast and other islands like Lihaga, Tindila, Talisei and Bangka. Bangka and the surrounding islands are quite exposed and often get strong currents which can come from all directions. Big pelagics come in to feed here and the reefs are alive with colour. There are a number of dive sites around Bangka Island; Batu Gasoh consists of a number of steep pinnacles rising up from the depths, a drift can be done around them and there are plenty of areas to escape the current. A number of large boulders and pinnacles can be dived at Sahaung and large step formations can be seen. Coral is very colourful here and there are plenty of schooling fish such as snappers, fusiliers and surgeonfish. Similar topography can be found at Batu Mandi and Batu Pendeta, there is also a plane wreck of a B-21 bomber at around 28 meters. There are a number of dive sites and house reefs on the mainland around Pulisan that offer shallower diving around pinnacles and rocks with equally as impressive marine life. The best feature of diving in the Bangka Islands is the pinnacle diving and its close proximity to Bunaken and Lembeh. The pinnacles attract lots of fishes and are covered with soft corals, sea fans, and feather stars. Currents can be strong but you can get out of it by staying on the lee side of the pinnacle. Away from the pinnacles there are good coral gardens with nudibranches, leaf fishes, ribbon eels and pygmy seahorses. Some Bangka Island pinnacles break the surface, while others are submerged. 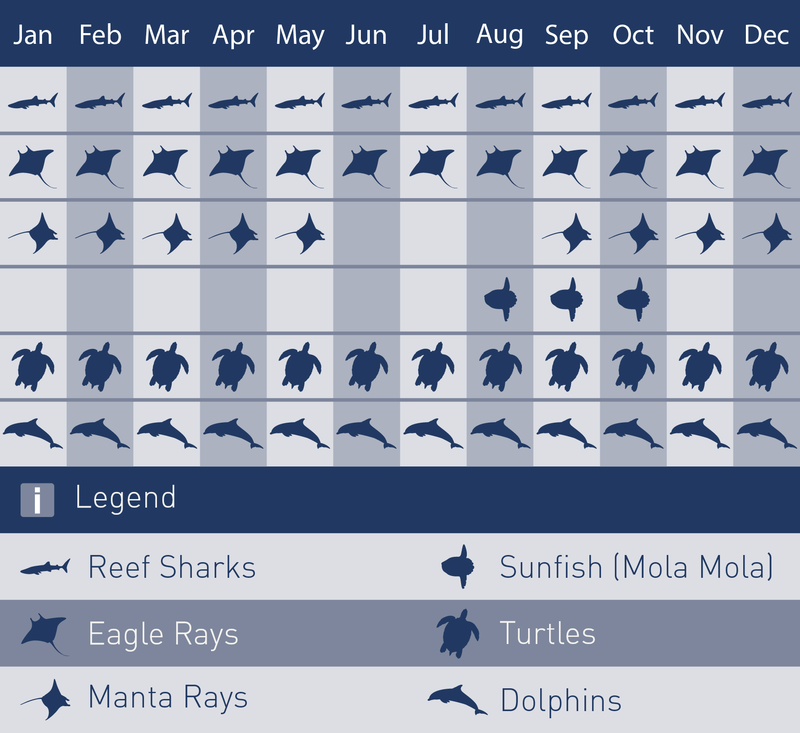 Batfish, jacks, barracuda and tuna frequent these sites. Crevices and overhangs entice moray eels and macro life. When the current is running the soft corals bloom. Lyre gorgonians inhabit the hard sand bottoms. Bangka Strait is a migratory route for whales, dolphins and manta rays and there's a good chance of seeing them March/April or August/September. You can dive in the Strait when the current isn't too strong. Lihaga Island has good hard corals and anemones with lots of basslets and clownfishes. Leaf fish and ribbon eels hang out among the corals. Talisei Island is known for its beautiful soft corals and gorgonians. There are resident sea snakes, unusual nudibranches, Napoleon wrasse and a large cavern to explore. 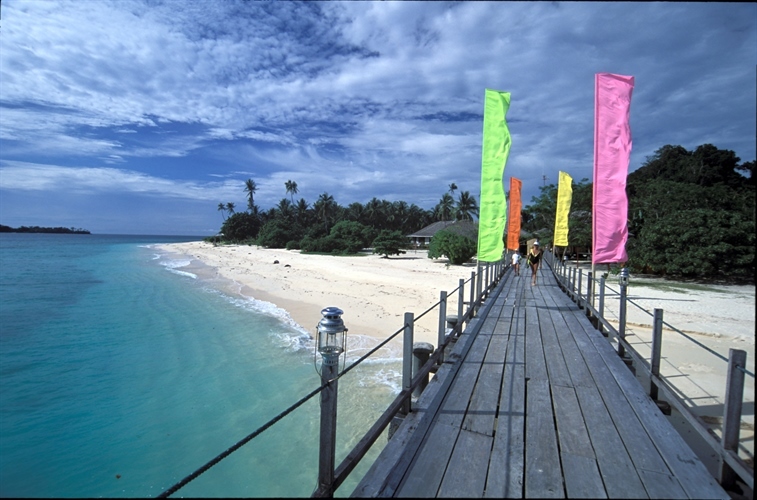 “Sahaung” – Situated on the east coast is a very well thought of Bangka scuba diving spot and for very good reason. The row of underwater boulder pinnacles that just break the surface here form giant steps underwater. This is a drift dive that requires a negatively buoyant entry, as waves can be present at the surface at drop off and pick up points. As you descend down the pinnacles you will marvel at the proliferation of green and golden brown soft corals, huge elephant ear sponges, dense thickets of branching green cup coral and table corals. There are carpets of frilled leather corals and pink, brown, cream and lilac soft coral trees swaying in the shallow surge. At the same time swarming all around you are redtooth triggerfish, midnight snappers, blue-striped snappers and long-fin bannerfish. Fish soup! If you are not sufficiently enthralled by this, then the site may also throw in teira batfish, pygmy seahorses, frogfish, harlequin sweetlips, palette surgeonfish and perhaps a whitetip reef shark or two might put in a guest appearance. "Breathtaking" and "awesome" are oft-used words on the boat after this Bangka dive. “Batu Mandi” - located just off the Sulawesi mainland, opposite Bangka, this dive site consists of a large rock jutting out of the surface, forming a steep slope. 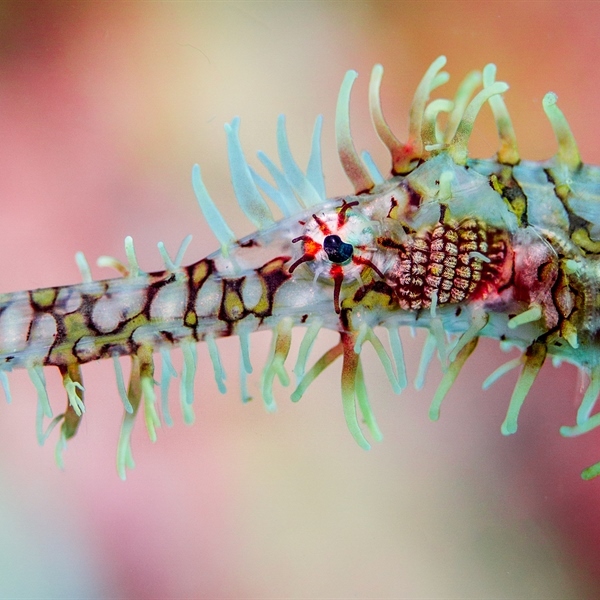 As you work your way along the wall here you will see no shortage of pretty macro life including ornate ghost pipefish, lots of nudibranchs and if you are lucky some gorgeous mantis shrimps. In addition to the abundant macro life, another major feature here are the colossal sea fans at around 20 m and on top of the reef a series of sea fans in hues of pink and red. At Batu Mandi there is no great variation in depth so diving here normally takes the form of a nice and easy shallow dive. Gangga Island is served by Manado’s International airport which means you do not have to waste any more time flying and get in the water as soon as possible. The luggage allowance for Singapore Airlines and Silk Air is 30KG from the UK. Gangga Island is 70 minutes drive from Sam Ratulangi International Airport, Manado (MDC) to Serei pier and 20 minutes by boat. 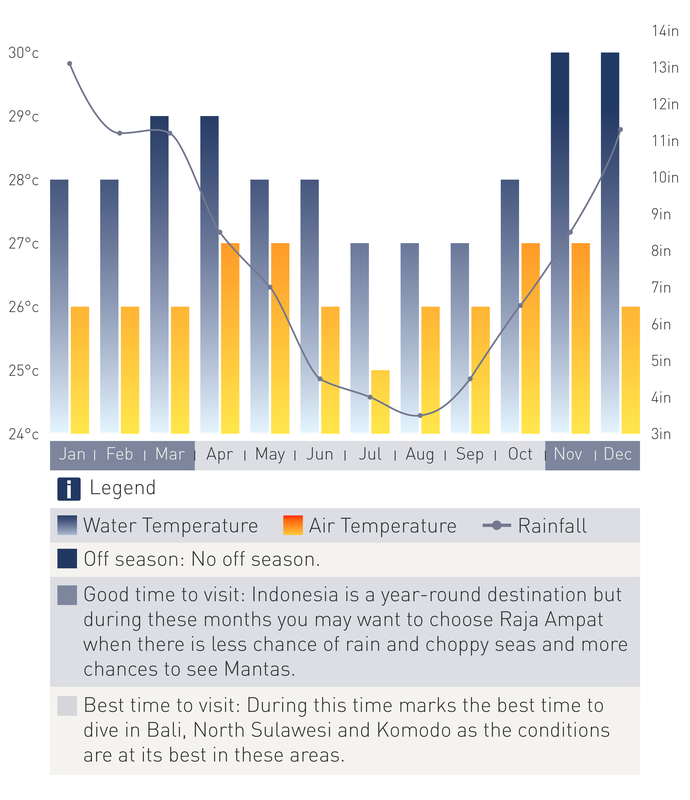 You can enjoy diving in Gangga Island all year round but overall the best season for dive conditions is from March to October. November to late-February sometimes sees winds and rains so surface conditions can be occasionally rough with 1 or 2 metre swells at that time. Water temperature (27-30°C) and visibility (20 - 35m) are pretty constant all year round. Sperm whales migrate through the region to calf in the Sangihe region in March and August.